Woody Allen is on a bit of a roll. After something like a decade of making mostly mediocre films, two of his recent ones have been fannnntastic: Vicky Cristina Barcelona and Midnight In Paris. 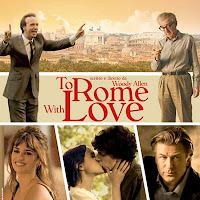 In 2012, he's hoping to keep his European renaissance going; this time in Rome. And while it's kind of hard to tell from the trailer whether this will be another hit or another miss, the cast is pretty exciting. Ellen Page, Jesse Eisenberg and Alec Baldwin, plus Penelope Cruz returning after her probably-should-have-won-the-Oscar performance in Vicky Cristina Barcelona. Allen himself is in it, too. Along with Roberto Benigni and kickass Woody Allen regular Judy Davis. Hey, worst case scenario it's another Curse of the Jade Scorpion or Anything Else, but with a bunch of gorgeous shots of Rome thrown in. According to the National Post, it'll be out in North America on June 22. He made several movies between Vicky Cristina Barcelona and Midnight In Paris. Op, two in fact: You Will Meet A Tall Dark Stranger and Whatever Works. Thanks. Updated.